The Rev. Thomas J. Euteneuer is president of Virginia-based Human Life International, which has affiliates and partners in 87 countries around the world. A trained exorcist, Fr. Euteneuer has been authorized to perform the ancient rite in several dioceses in the U.S. Forget the levitation, the twisting heads, and other nonsense that Hollywood has used to attempt to portray the Rite of Exorcism. Moviemakers are in the business of selling tickets and making money, so they have a vested interest in playing up the theatrical in any situation, whether it accurately represents reality or not. The Church, on the other hand, seeks to preach the truth and save souls, so she has a vested interest in an accurate, honest, and thorough presentation of evil in order to warn the world about the enemy of our human nature. Unfortunately, The Exorcist movie has formed the average person’s perception of exorcism for the past three and a half decades, so there is need to purify our understanding of this sacred rite, which belongs exclusively to the Church. An exorcism is not a scary docudrama intended to tantalize our prurient interest in the occult. It is an act of the Church, a superior spiritual force that takes authority over a demon (evil personified) for the protection and liberation of a human being. In this battle between spiritual forces, the Church first restricts and then progressively destroys the demon’s power to the point where it loses its possessing grasp of the person and is then cast out and sent to the foot of the cross, the place where Jesus Christ executed eternal judgment on the devil. Every exorcist knows that demons fear this ritual so much that, when an exorcism begins, it is very common to see the possessed person shake like a leaf in fear of what is about to take place. The demon is rooted in the body of the person after having gained entrance through some occult practice or victimization, and the demon downloads its abject fear of the Church into the person it possesses, such that the whole body of the possessed person shakes violently. It is not the human being who is frightened of the exorcism — it is the demon inside. Exorcisms, however, are not magical services in which the demon automatically departs upon the exor­cist’s command. Would that it were so! 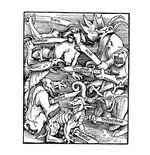 Demons in a possessed person often act violently, attempting to resist the holy force of the Church. It typically takes hours to drive out a demon, and exorcisms sometimes have to be extended to multiple sessions. The more demons that inhabit a person, the longer an exorcism takes. It is proper to speak of exorcism as a process rather than as a single act. Only a tiny number of American priests are trained in the rite of exorcism, and these few have been overwhelmed by requests to evaluate claims of possession.